The first “Labour Demand Survey”(LDS) in Sri Lanka, conducted by the Department of Census and Statistics (DCS), recorded nearly half a million vacancies in the private sector. A large portion of these vacancies are found to be in routine and non-routine manual jobs. However, most of Sri Lanka’s job-seekers are educated youth, who instead, search for white-collar jobs. This situation has given rise to a “sectoral mismatch” between the demand and supply of labour in Sri Lanka. That is, a mismatch between sectors where job openings lie and sectors where job-seekers search for work. The blog discusses this mismatch using LDS data, and looks at ways in which it can be resolved. The LDS revealed that of 497,302 vacancies in the (formal and informal) private sector in the first half of 2017, vacancies for sewing machine operators, security guards, shop sale assistants, advertising and marketing professionals, and commercial and sales representatives, topped the list. The survey also quantifies vacancies that are ‘hard-to-fill’ and ‘recruitments’. The same occupations mentioned above fall into the top 5, with the exception of advertising and marketing professionals and the inclusion of ‘cleaners and helpers’ (Table 1). As such, overall labour demand is largely concentrated in middle and low-skill jobs involving manual tasks, rather than in high-skill jobs. IPS research has found similar evidence of there being a low number of vacancies for “good” jobs. When it comes to these “good” jobs, or jobs in professional occupations, advertising and marketing professionals, nursing professionals, and mechanical engineering technicians top the list, as per the LDS. Of these, only advertising and marketing professionals fall into the top ranked high demand jobs (Table 1). What is Giving Rise to ‘Sectoral Mismatch’? The LDS clearly signals the overwhelming shortage of manual workers. These numbers reinforce findings from a recent study on labour shortages in the manufacturing sector, which notes that manufacturing jobs – particularly in the apparel sector – are becoming increasingly undesirable. Competing sectors such as tourism and retail offer more competitive wages, better working conditions, and higher social recognition. In addition, youth have shifted career aspirations from routine-manual jobs (such as factory workers) and non-routine manual jobs (such as security guards) towards non-routine-cognitive jobs (such as computer-based jobs) that require higher skill and interaction. With the general increase in average wages of Sri Lankans, toiling in factories for poor wages and engaging in manual tasks that provide little scope for career progression, are no longer desirable. 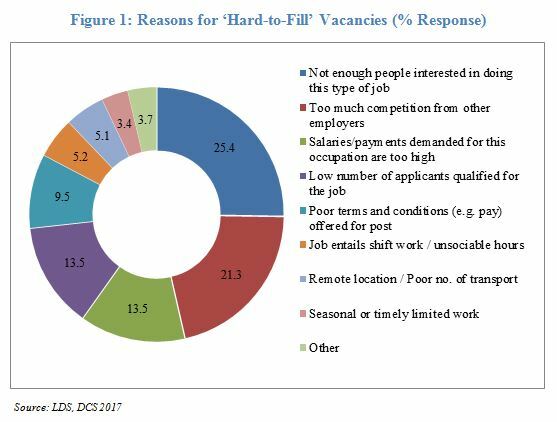 This is reflected in the LDS data on employer perceptions on reasons for vacancies being ‘hard-to-fill’ – a quarter of employers surveyed believe that lack of interest in the given job contributes to this (Figure 1). Moreover, job openings remain in sectors where job-seekers are no longer searching for jobs. The supply of labour is young, educated, and have aspirations for high-skill jobs, in sectors outside those that are in demand. This gives rise to a sectoral mismatch between labour demand and supply. 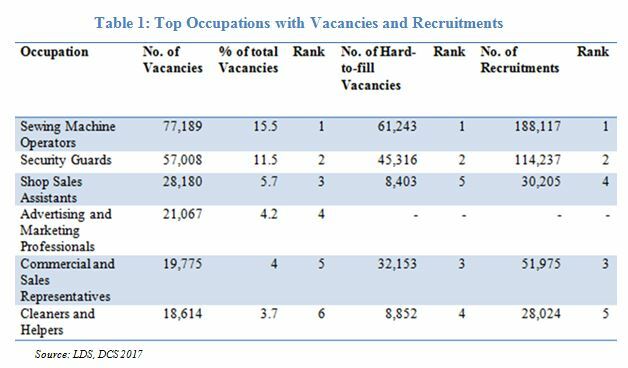 Apart from high demand manual jobs going unfilled, another concern with sectoral mismatch is that sectors in which job-seekers wish to supply labour have limited vacancies. Only 7.2% of private sector vacancies are in high-skill occupations, according to LDS data. Sri Lanka is known to suffer from slow job creation, which has partly contributed to this. IPS researchers have also argued that the limitation in vacancies could be stemming from job-seekers lacking competence in general skills required to secure a “good” job; English and ICT skills are lacking, but are highly demanded by private sector employers. A World Bank study found that 80% of employers expect English literacy from high-skilled workers although only 20% of Sri Lankans are fluent in English. In addition, 30% of employers surveyed in the LDS cited communication skills as one of their top needs. Over the next year, top hires are expected to be in jobs for tailors and dressmakers (74,079), commercial and sales representatives (69,865), and sewing-machine operators (63,341). To what extent can the demand for these middle-skill manual jobs be met in the presence of sectoral mismatch? Policies need to focus on re-adjusting demand towards more high-skill sectors. First, policies should look at automation as a means of moving away from the dependency on labour-intensive manufacturing. Experts in the apparel sector, for instance, have long acknowledged the need to automate tasks in order to overcome labour shortages. Sri Lanka was once able to compete as a low labour-cost destination, but this is no longer the case; rising labour costs in Sri Lanka have made countries like Bangladesh and Vietnam relatively more competitive. Hence, Sri Lanka has reached a juncture where it seems timely for the sector to transition away from labour-intensiveness towards automation in manufacturing, in the absence of a labour supply pool to fill jobs. Second, attracting foreign workers to fill shortages in other types of manual jobs (cleaners, helpers, security guards, etc.) should also be considered. Although the general public tends to oppose this idea, (ETCA being the famous example) the motivation behind this is based on the concept of labour market segmentation, under which labour demands in certain sectors are met with the help of migrant workers when the labour force in the host country is unavailable or unwilling to take on those jobs. Since locals are unwilling to fill certain positions, tapping the global talent pool serves as a practical solution in meeting demand. While addressing shortages in high demand sectors is one priority in resolving sectoral mismatch, ensuring that people searching for jobs in high-skill sectors, can in fact secure those jobs, is another priority. Although Sri Lanka’s education system has tried to incorporate soft-skills training into curricular, there is still a lack of desire on the part of the students to learn English and ICT up to the required private sector standards, as degree holders have been routinely provided with public sector jobs. One solution is making internships part of course curricular from secondary school onwards, akin to ‘summer internship’ programmes that are commonplace for students in other countries. Although these programmes are already conducted in some universities, being exposed to on-the-job training from an earlier age will give students more time to master these skills. This may help bridge the gap between employee expectations and what workers bring to the table, which might in turn, create more openings in high-skill jobs desired by the labour pool.